Here is my philosophy of teaching, at least as it stands right now. 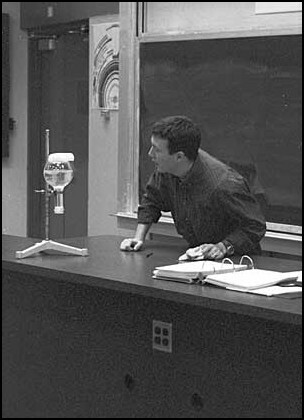 I teach and advise many of our science teaching majors. This class is an overview of scientific principles and processes in physics and chemistry, allowing students to experience appropriate science teaching pedagogies for elementary school use. More important, this course becomes a kind of sandbox for engaging future teachers in authentic science practice. This yearlong course covers a wealth of topics in physics at the problem-solving level (algebra & trigonometry, no calculus). Many students in pre-professional programs take this course. See also the general physics labs. This course is an active inquiry into how and why we teach science, including how to model authentic science in the classroom, how to teach for understanding, and how to assess student understanding. Frankly, I don't really know how to teach how to teach, so it really becomes an ongoing pursuit of each student to figure this out for themselves. I get to teach in this program designed for elementary teachers to gain extra credentials and experiences in STEM teaching and learning. This one semester course is a survey of conceptual physics. This fills a general education requirement and has no prerequisite. This one semester course is a survey of conceptual astronomy/astrophysics. This fills a general education requirement and has no prerequisite. Co-taught with Carl Porter (English), this course compares the ways of knowing of science, writing, and cultural/belief systems. This was originally offered as an upper division seminar in honors, but we've since developed it as a more foundational course for the program. In our opinion, everyone should take this class, regardless of major, right as they enter college. Unfortunately, we only have 15 seats. I first designed this curriculum in 1998-99 and have recently brought it back to life. This one semester honors course is aimed at showing students how physics (and science in general) works, and how it applies to everyday pursuits. In this course we use the New York Times as our text, keeping us up-to-date with important societal issues and giving us an outline of the physics concepts the class will investigate deeply. I get to team teach this course with Eric Swedin. We look at how science, technolgy, and culture all interact with one another and what science is and what it produces. This course focuses on the nature of science and scientific inquiry, science learning, and current research efforts in science education. Students in this class create their own peer reviewed, scientific journal, as well as investigate what we understand about science learning. It is a program requirement for all science teaching majors, but it's useful to others with interests in science education as well. Currently this is a one-credit hour independent readings course. It's being proposed as a more comprehensive course as part of a proposed NSF project. Senior physics majors (including teaching majors) take this course. They present their own research, as well as attend other presentations. The department updates the schedule of presentations on its web page. This graduate level course in education is about the nature of science, how it is learned, and how we teach it. I'm currently teaching it at Weber State, but previously taught a course for the Department of Teaching & Learning at the University of Utah. An intensive one week workshop, most recently offered in the summer of 2012. Meets requirements towards a state endorsement in physics teaching.